Before we get into the tips I want to make one thing clear — fear is tough to manage. I’m not going to lie and guarantee that these tips will immediately have your dog jumping for joy every time bath rime rolls around. Nothing’s quite that simple, and much of it depends on how fearful your dog is of the bath to begin with. An older dog whose been afraid of bathing for years will be tougher to keep calm than a young pup who doesn’t have years worth of anxiety to overcome. But the one thing they do have in common is that they will make it less stressful for your dog, and over time you’ll start to see a difference in the way your dog reacts to the bath. 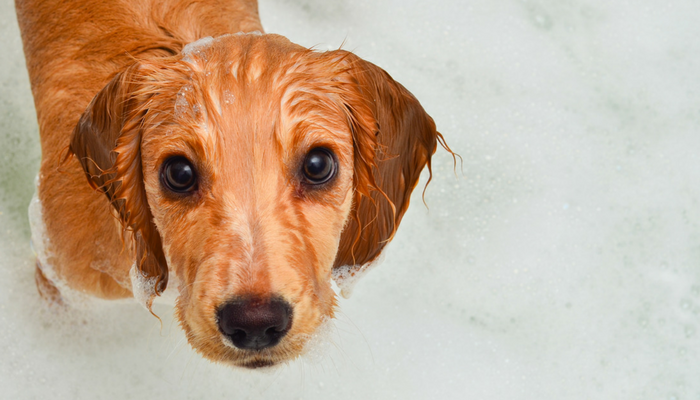 Here’s how to make bath time easier for your dog. When it comes to making bath time easier on your dog one the most important things to remember is to be prepared. That includes having your shampoo, towels, a cup for rinsing and any toys or treats you might use ready to go beforehand. If your dog’s already nervous in the tub they’re going to get even more stressed out if you leave them alone in that scary place while you go to grab those towels you forgot. 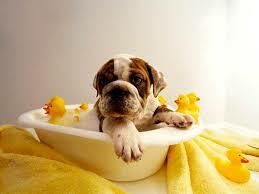 You can make things a little less stressful for your dog by filling up the tub with warm water before they get in. The sound of running water might sound mundane to us, but for dogs who hate the bath time that noise (and all splashing water) causes extra stress. Does your dog slip around when they’re in the tub? That’s a huge factor when it comes to making your dog feel comfortable in the tub. Not being able to get your footing without slipping is really scary, so it’s important to make sure the surface of the tub is nonslip. If you don’t have a mat (or any nonslip materials on your tub floor) that prevent slipping you can lay out a thick towel for your dog to stand on. If your dog isn’t a fan of the bath chances are they’re not going to like being rinsed off with the faucet or shower head either. They’re rather noisy, and the addition of all that extra water splashing around can make dogs nervous. I prefer using a cup to do the rinsing since it’s quiet and less imposing. A cup also gives you better control when it comes to preventing water from getting into your dogs eyes and ears. When it comes to making your dog comfortable in the tub remember to be keep their eyes, nose and ears protected. If your dog is already stressed out getting water in their eyes or ears is just going to stress them out even more. Using a washcloth will give you better control and make it easier to prevent water from splashing into their eyes, nose and ears. One of my favorite tricks for making bath time less stressful for my dog is by using toys and/or treats. Depending on how fearful your dog is you might need to use high value treats to keep them distracted. My favorite distraction technique is the peanut butter trick, but if you don’t want to smear peanut butter in the tub (completely understandable) you can simply hand out regular dog treats throughout bath time or use a toy that floats like the Max Glow Ball (Laika’s personal favorite). If your dog hates bath time one way you can help is by exercising them beforehand. Exercise alone won’t make your dog suddenly love the bath, but it can be calming. And any exercise, whether it’s mental or physical, can help them burn off some extra energy. Will it burn off enough energy to prevent them from going crazy and getting to zoomies after a bath? Probably not — I’m not sure that reaction ever goes away. If your dog is terrified of the bath you can help ease their stress by getting in there with them. When Laika was younger she was absolutely terrified of the bath, and the one thing that helped the most was getting in the tub with her. I’d put on a bathing suit and just sit down next to her during the entire process. It didn’t make her start jumping for joy every time bath rime rolled around, but it did make a noticeable difference when it came to her nervousness. She stopped trying to escape, she stopped whining, and after each bath she began to relax more and more. If bathing your dog stresses you out chances are your stress will rub off on your dog. You can make things easier on yourself (and your dog) by asking a friend or family member for help. They can work on keeping your calm while you work on the bathing part.